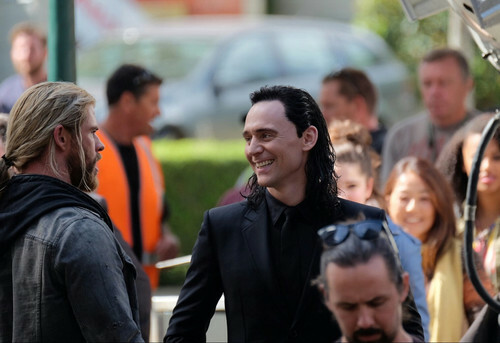 Thor: Ragnarok - 방탄소년단. . HD Wallpaper and background images in the Thor: Ragnarok club tagged: photo marvel thor: ragnarok chris hemsworth tom hiddleston bts pictures. This Thor: Ragnarok photo contains 신사복 and 비즈니스 정장. There might also be 거리, 도시 현장, 도시의 설정, 도시 장면, 도시 설정, 도시 거리, and 도시 장면 설정.